White Cliff Minerals Limited (ASX:WCN) is pleased to report a maiden Inferred Mineral Resource reported in accordance with the guidelines of the JORC Code, for the Coronation Dam nickel-cobalt deposit. White Cliff Minerals Ltd (ASX:WCN) present their report for the half-year ended 31 December 2018. 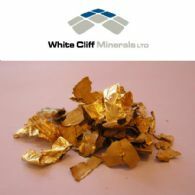 White Cliff Minerals Limited (ASX:WCN) is pleased to report gold assays for the bulk samples collected in December 2018. White Cliff Minerals Limited (ASX:WCN) is pleased to announce that the Company&apos;s rights issue, as detailed in the Prospectus dated 14 February 2019, received strong support by shareholders with $646,278 worth of applications accepted by the Company. Therefore, the short fall under the offer is $508,598. White Cliff Minerals Ltd (ASX:WCN) Non-renounceable Rights Issue pro rata offer to Eligible Shareholders of approximately 230,975,294 New Shares at an issue price of $0.005 per New Share on the basis of 1 New Share for every Existing Share held. White Cliff Minerals Ltd (ASX:WCN) is pleased to announce a partially underwritten non-renounceable entitlements offer of one new share for every one White Cliff share held, at an issue price of $0.005 per new share to raise up to $1,154,876 before costs. 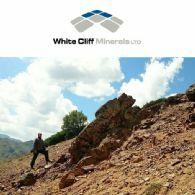 White Cliff Minerals Limited (ASX:WCN) is pleased to report that following recent review of its operations requirement, the Board has identified and implemented savings of circa $500,000 per annum by rightsizing its management and exploration team, and rationalising and re-negotiating various administration expenditures. White Cliff Minerals Ltd (ASX:WCN) provides the Company&apos;s Quarterly Report for the period ended December 2018. White Cliff Minerals Ltd (ASX:WCN) is pleased to report that visible gold has been identified in bulk samples collected in December 2018. 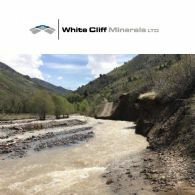 White Cliff Minerals Limited (ASX:WCN) is pleased to report that assay results have been received from the new mineralised structures identified 2-4 kilometres east of the Aucu Gold Project in the Kyrgyz Republic. White Cliff Minerals Limited (ASX:WCN) advises the appointment of Nicholas Ong and Daniel Smith as directors and the resignation of Jack Gardner. 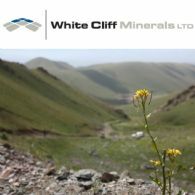 White Cliff Minerals Ltd (ASX:WCN) is pleased to report that it has completed an extensive soil geochemistry survey at the Aucu Gold Project in the Kyrgyz Republic. White Cliff Minerals Limited (ASX:WCN) is pleased to report new assays from a 5,000 metre RC drilling campaign completed at its 100% owned Coronation Dam cobalt project 90km Southeast of Glencore&apos;s Murrin Murrin Nickel refinery in Western Australia&apos;s north-eastern goldfields. White Cliff Minerals Limited (ASX:WCN) ("White Cliff" or "the Company") is pleased to advise that the Renounceable Entitlements Offer announced on 16th October ("the Offer") has closed. White Cliff Minerals Ltd (ASX:WCN) supplementary prospectus (Supplementary Prospectus), intended to be read with the prospectus dated 16 October 2018) (Prospectus), issued by White Cliff Minerals Limited (ACN 126 299 125) (Company). White Cliff Minerals Ltd (ASX:WCN) provides the Company&apos;s Quarterly report for the period ended 30 September 2018. White Cliff Minerals Ltd (ASX:WCN) provides the Company&apos;s Investment Presentation. White Cliff Minerals (ASX:WCN) advise that it has appointed Mr Jack Gardner as Non-executive Chairman effective 26 October 2018. White Cliff Minerals Ltd (ASX:WCN) provides the Company&apos;s Renounceable Rights Issue Prospectus. White Cliff Minerals Limited (ASX:WCN) is pleased to announce a partially underwritten renounceable pro rata offer of two New Shares (2) for every one (1) White Cliff Share held, at an issue price of $0.015 per New Share to raise up $2,309,754. 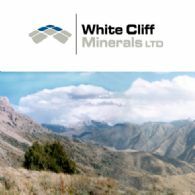 White Cliff Minerals (ASX:WCN) advise that it has appointed Mr Ian Hobson as Company Secretary effective 28 September 2018. 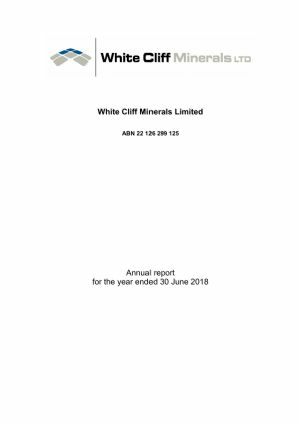 White Cliff Minerals Ltd (ASX:WCN) provides the Company&apos;s Annual Report for the year ended 30 June 2018. White Cliff Minerals (ASX:WCN) will seek shareholder approval to consolidate its issued share structure on a 50:1 basis and will seek to divest non-core assets. In conjunction with the consolidation the directors have agreed to cancel all outstanding performance incentives for no consideration. White Cliff Minerals Ltd (ASX:WCN) provides the Company&apos;s Quarterly Report for the period ended 30 June, 2018. White Cliff Minerals Limited (ASX:WCN) is pleased to report initial assays from a 5,000 metre RC drilling campaign completed at its 100% owned Coronation Dam cobalt project 90km Southeast of Glencore&apos;s Murrin Murrin Nickel refinery in Western Australia&apos;s north-eastern goldfields. White Cliff Minerals Limited (ASX:WCN) is pleased to provide an update on exploration drilling conducted at its 100%-owned Coglia Well cobalt-nickel project near Laverton in the Western Australian goldfields. White Cliff Minerals Limited (ASX:WCN) is pleased to report that RC drilling has been completed at its 100% owned Coronation Dam cobalt project near Kookynie in Western Australia&apos;s north-eastern goldfields. White Cliff Minerals Ltd (ASX:WCN) provides the Company&apos;s latest investor presentation. White Cliff Minerals Limited (ASX:WCN) is pleased to announce that it has been advised by the Australian Taxation Office that Company&apos;s application for tax credits under the Federal Government&apos;s Junior Minerals Exploration Incentive scheme has been assessed and fully allocated. White Cliff Minerals Limited (ASX:WCN) is pleased to report that it has today issued 1,666,667 ordinary shares following the exercise of 1,666,667 June 2019 Options at an exercise price of $0.01 each. 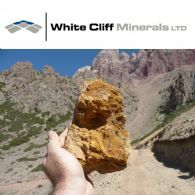 White Cliff Minerals Limited (ASX:WCN) is pleased to report a new JORC code compliant inferred gold and copper mineral resource for the Aucu Project in north-west Kyrgyz Republic. 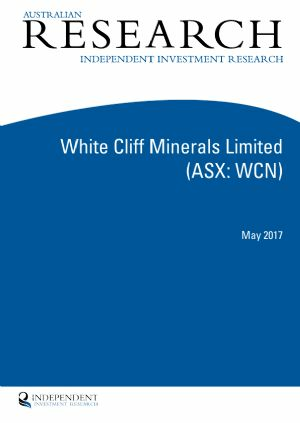 White Cliff Minerals Ltd (ASX:WCN) provides the Company&apos;s Annual Report for the period ended 30 June 2017. White Cliff Minerals Ltd (ASX:WCN) advises that it has issued for 468,596,860 ordinary shares at an issue price of $0.002 upon completion of the Company&apos;s 1-for-2 non-renounceable rights issue. White Cliff Minerals Limited (ASX:WCN) advises that it has received valid applications for 468,596,780 ordinary shares to be issued at an issue price of $0.002 following the closure of the Company&apos;s 1-for-2 non-renounceable rights issue. The $937,194 raised from this issue will be used to further advance the Company&apos;s exploration projects both in the Kyrgyz Republic and Australia. 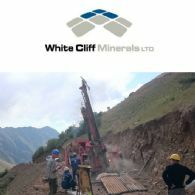 White Cliff Minerals Limited (ASX:WCN) is pleased to provide an update on drilling activities being completed in the 2017 field season at its 90%-owned Aucu gold deposit in north-west Kyrgyz Republic. White Cliff Minerals Ltd (WCN.AX) advises that it has resolved to extend the closing date of the recently announced Rights Issue by five business days following postal delays affecting the delivery of Entitlement Forms to shareholders. White Cliff Minerals Limited (ASX:WCN) advises that the Rights Offer Prospectus and Entitlement and Acceptance Forms pursuant to a non-renounceable rights issue announced on 3 August 2017 have today been sent to Eligible White Cliff shareholders. White Cliff Minerals Limited (ASX:WCN) is pleased to announce that a new gold zone has been discovered at its 90%-owned Aucu Gold Deposit in north-west Kyrgyz Republic adjacent to the three zones identified at the Eastern Gold Zone in 2016. White Cliff Minerals Ltd (ASX:WCN) advises that the attached letters have today been sent to WCN Shareholders. White Cliff Minerals Ltd (ASX:WCN) advises that the attached letter has today been sent to WCN Option Holders. 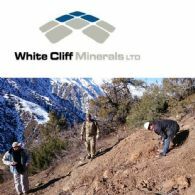 White Cliff Minerals Ltd (ASX:WCN) is pleased to announce a non-renounceable pro rata offer of one New Share (1) for every two (2) White Cliff Shares held at an issue price of $0.002 per New Share to raise up to approximately $1,879,477. White Cliff Minerals Ltd (ASX:WCN) is pleased to announce that the 2017 field season drill program has commenced at its 90%-owned Aucu Gold deposit in north-west Kyrgyz Republic. White Cliff Minerals Ltd (ASX:WCN) provides the Company&apos;s Quarterly Report for the period ended 30 June 2017. White Cliff Minerals Ltd (ASX:WCN) is pleased to report that one metre assays have confirmed significant gold mineralisation in air-core drilling at the East Burtville Gold Prospect which forms part of the Merolia Gold Project, near Laverton Western Australia. White Cliff Minerals Ltd (ASX:WCN) is pleased to announce that it has finalized a drilling contract with mining contractor Geostandart LLC. White Cliff Minerals Ltd (ASX:WCN) is pleased to provide an update on exploration progress at the Aucu gold project. White Cliff Minerals Ltd (ASX:WCN) is pleased to report that significant cobalt mineralisation has been identified at the Ghan Well project near Laverton in Western Australia. 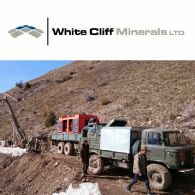 White Cliff Minerals Ltd (ASX:WCN) is pleased to report that metallurgical test work on samples taken from the 2016 drilling program at the Aucu Gold Deposit in Kyrgyz Republic have delivered excellent gold recoveries. The metallurgical test work was carried out by the Bureau Veritas Minerals Laboratory in Perth. 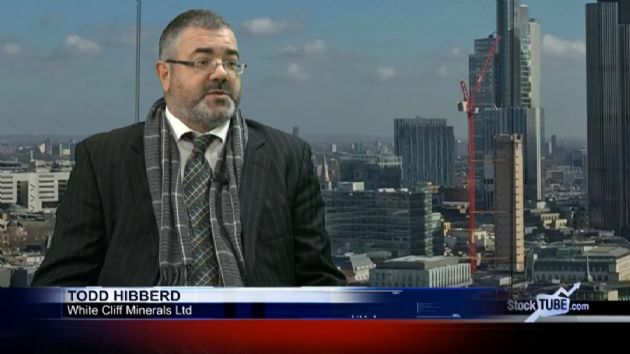 White Cliff Minerals Ltd (ASX:WCN) are pleased to provide an interview with Managing Director, Todd Hibberd, on the upgraded resource estimate at the Aucu gold project in Central Asia. White Cliff Minerals Limited (ASX:WCN) is pleased to report that Independent Investment Research has released a research note on White Cliff Minerals Limited. White Cliff Minerals Ltd (ASX:WCN) is pleased to report that it has identified significant gold mineralisation in air-core drilling at the East Burtville Gold Prospect which forms part of the Merolia Gold Project, near Laverton Western Australia. White Cliff Minerals Ltd (ASX:WCN) is pleased to provide the Company&apos;s Quarterly Report for the period ended 31 March, 2017. White Cliff Minerals Limited (ASX:WCN) is pleased to report that the 2017 field exploration program has commenced at the Aucu gold project. White Cliff Minerals Limited ("White Cliff" or the "Company") is pleased to report a new JORC compliant inferred resource for the Aucu gold deposit, using a lower cut-off grade of 1 g/t gold, of 1.8 million tonnes grading 5.2 g/t gold, for 302,000 ounces of contained gold. White Cliff Minerals Limited (ASX:WCN) advises that drilling has commenced at the Lake Percy Lithium Project. White Cliff Minerals Ltd (ASX:WCN) is pleased to invite investors to hear Managing Director, Todd Hibberd present for White Cliff Minerals at Proactive Investors CEO Spotlight Investor Sessions in Sydney and Melbourne. 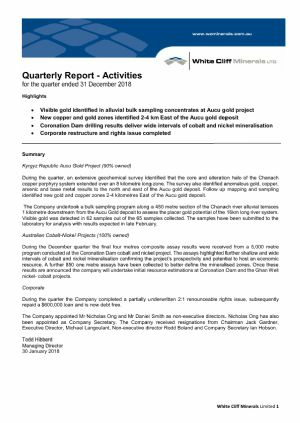 White Cliff Minerals Ltd (ASX:WCN) is pleased to report that all mineralised intervals reported from the high grade Aucu gold deposit in 2016 have been confirmed by duplicate analysis at the Bureau Veritas laboratory in Perth. White Cliff Minerals Ltd (ASX:WCN) is pleased to provide the Company&apos;s Half Yearly Report for the period ended 31 December 2016. 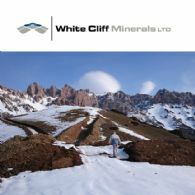 White Cliff Minerals Ltd (ASX:WCN) is pleased to update the market on progress with the development of the Aucu gold deposit in Central Asia. White Cliff Minerals Ltd (ASX:WCN) is pleased to report that substantial gold in soil anomalies has been identified at Comet Well along the Central Gold Trend near Laverton in Western Australia. 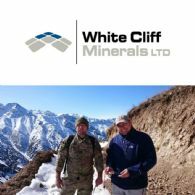 White Cliff Minerals Ltd (ASX:WCN) is pleased to announce that it has acquired an additional 1% of the Kyrgyz Republic Aucu gold project from an external shareholder, Somerley Limited of Hong Kong, through the issue of 12 million new ordinary shares. White Cliff Minerals Ltd (ASX:WCN) is pleased to provide the Company&apos;s Quarterly Reports for the period ended 31 December 2016. White Cliff Minerals Limited (ASX:WCN) is pleased to report the final 2016 drilling results from the Aucu gold project. White Cliff Minerals Ltd (ASX:WCN) is pleased to report the grant of a 20 km2 tenement immediately North and adjacent to the Lake Percy Joint Venture tenement where Liontown Resources recently identified a 2km long anomalous lithium trend. White Cliff Minerals Limited (ASX:WCN) is pleased to report that it has identified gold mineralisation in air-core drilling at the Ironstone gold project part of the Merolia gold project, near Laverton Western Australia. White Cliff Minerals Limited (ASX:WCN) is pleased to report that more substantial gold and copper mineralisation has been identified in new drilling at the Quartz Zone within the Aucu Gold project. White Cliff Minerals Ltd (ASX:WCN) is pleased to advise that its share purchase plan (SPP) closed raising a further $1,050,000 in equity capital. Applications for 139,666,667 shares at an issue price of $0.0075 were received from existing shareholders under the SPP. White Cliff Minerals Ltd (ASX:WCN) is pleased to report that it has commenced a 2,000 metre air-core drilling program targeting a large gold anomaly at the Ironstone Gold prospect, part of the Merolia gold project, near Laverton Western Australia. 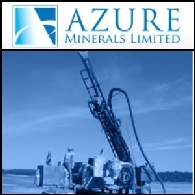 White Cliff Minerals Ltd (ASX:WCN) is pleased to report that substantial gold and copper mineralisation has been identified in new RC drill holes at the Quartz Zone within the Aucu Gold project. White Cliff Minerals Ltd (ASX:WCN) is pleased to report that statutory approvals have been received to conduct drilling at the Ironstone Gold prospect, part of the Merolia gold project, near Laverton Western Australia. White Cliff Minerals Ltd (ASX:WCN) is pleased to announce that it has completed a $1.5 million placement to professional and sophisticated investors through the issue of 200 million new shares at 0.75 cents per share. Participants in the placement will also receive one attaching option exercisable at $0.013 on or before 31 December 2018 for every three shares subscribed. White Cliff Minerals Ltd (ASX:WCN) is pleased to provide the company&apos;s Quarterly Report for the period ended 30 September 2016. 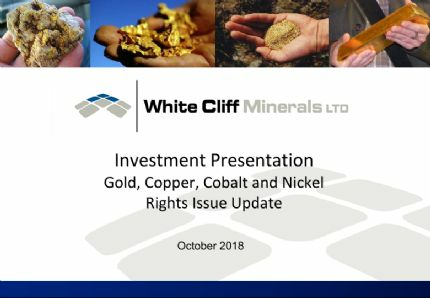 White Cliff Minerals Ltd (ASX:WCN) is pleased to provide its Investor Update for September Quarter regarding high grade gold mineralisation on two continents. 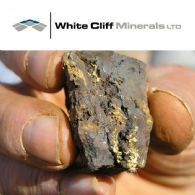 White Cliff Minerals Limited (ASX:WCN) is pleased to report that sampling conducted over existing historically mined surface rock piles has identified substantial gold mineralisation at the Burtville East gold prospect, part of the Merolia gold project, near Laverton Western Australia. White Cliff Minerals Ltd (ASX:WCN) is pleased to report that the infill sampling has expanded the bullseye gold in soil anomaly identified at the Ironstone gold prospect, part of the Merolia gold project, near Laverton Western Australia. White Cliff Minerals Ltd (ASX:WCN) ("White Cliff" or the "Company") is pleased to report additional visible gold intersections from recent drill holes at Quartz Zone within the Aucu Gold project. White Cliff Minerals Limited (ASX:WCN) is pleased to report that a bullseye gold in soil anomaly has been identified at the Burtville East gold prospect, part of the Merolia gold project, near Laverton Western Australia. White Cliff Minerals Ltd (ASX:WCN) is pleased to report additional visible gold intersections from recent drill holes at Quartz Zone and the Eastern Gold Zone within the Aucu Gold project. White Cliff Minerals Ltd (ASX:WCN) ("White Cliff" or the "Company") is pleased to report that a bullseye gold in soil anomaly has been identified at the Ironstone gold prospect, part of the Merolia gold project, near Laverton Western Australia.